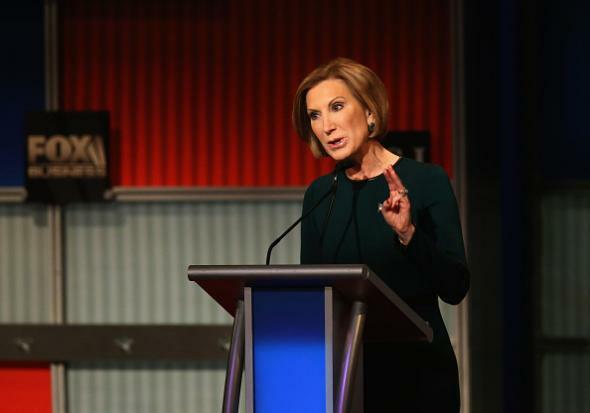 Carly Fiorina zings Trump over green room Putin meeting, admits meeting Putin in green room. Carly Fiorina at the Republican presidential debate on Nov. 10, 2015, in Milwaukee. One of the reasons I’ve said that I would not be talking to Vladimir Putin right now—although I have met him as well, not in a green room for a show, but in a private meeting. One of the reasons I’ve said I wouldn’t be talking to Vladimir Putin right now is because we are speaking to him from a position of weakness brought on by this administration, so, I wouldn’t talk to him for awhile. Fiorina’s campaign confirmed that the meeting took place in a green room, but Press Secretary Anna Epstein drew a distinction between one at a conference and a green room at a TV show. Imagine being Anna Epstein and having to say this stuff. What a world.